A 100% beef patty with cheese, tomato, Batavia lettuce, sour cream and a chilli and bean sauce in a cheese and paprika focaccia. Price: £4.99 as part of a value meal, 40p extra to go large. Kcal: 645 for the burger only. 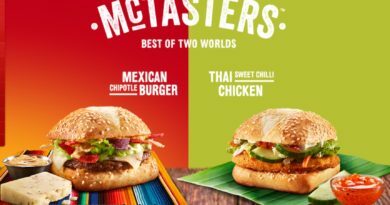 McDonald’s continues the four week ‘Great Tastes of the World’ promotion with ‘The Chilli Cheese & Mexican’ burger. Now you may be asking yourself what happened to ‘The Australian BBQ Supreme’ review? 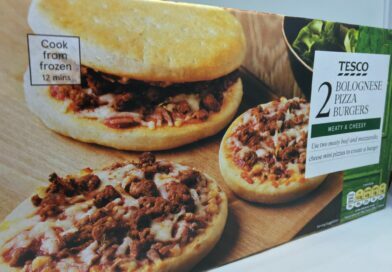 It is a tale of sorrow and woe – we went to the local drive thru to get this and were told it had sold out and all that was available was the previous promotional burger. So we set off to the drive thru (which is undergoing renovation) today in search of the new Chilli & Cheese Mexican. This time it is day 1 of the promotion so there would be plenty of these babies available… surely!? Arrived to find a massive crane and to cut a long story short the whole place was closed. So manically driving off we headed to the dreaded ‘Lower High street’ in search of the ‘magnificent and mouth-watering Mexican feast’. Enough of this… let’s get to the burger. Well for a start I was told it would be a couple of minutes and the guy would bring it over (nice touch) but I was happy to wait at the counter. The good news again is that these burgers are not pre-made so you know they are making it up fresh as it took approximately 3-5 minutes. 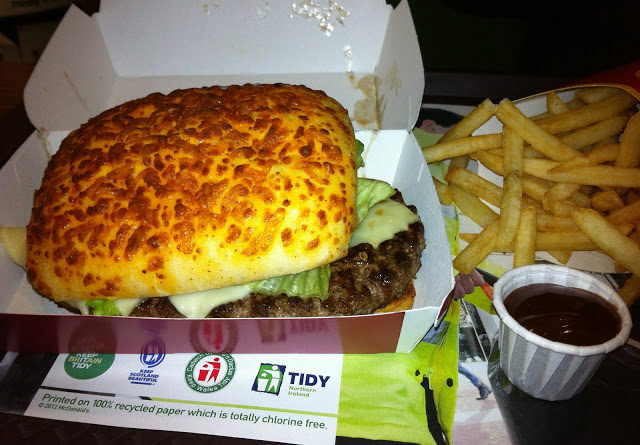 The 100% beef patty was the same one used for the Spanish Grande and I assume for the Australian BBQ. 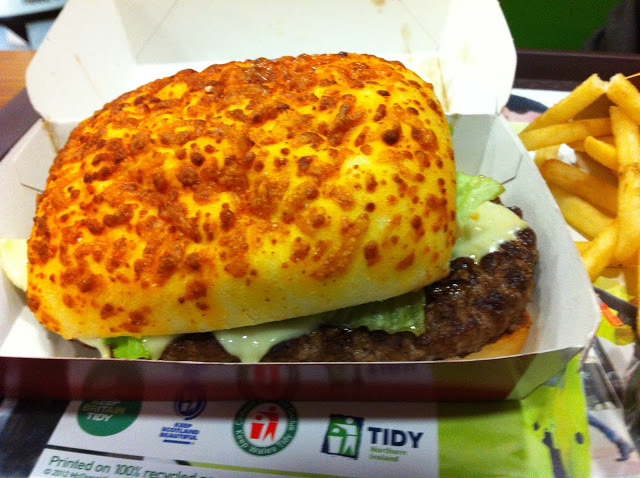 The burger was way too big for the cheese & paprika focaccia and the actual bun didn’t really taste of anything (opposed to the strong paprika taste of the Grande). 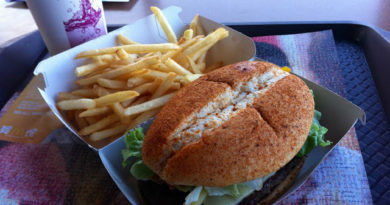 The bun had a spongy texture to it and held the ingredients well together. I did notice what looked like grease in the top of the box and you can see this in the photos. I wouldn’t say it put me off but I did comment on it at the time. 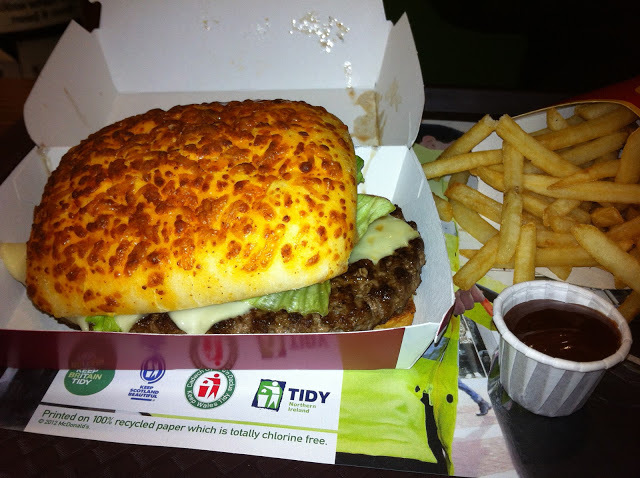 The cheese was melted on this burger and I could pick out its distinct flavour which brought everything together well. I don’t eat fresh tomato and this was removed so cannot comment but the lettuce this time was better and again I could actually taste it. 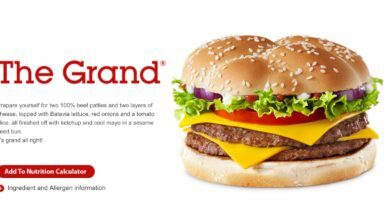 Overall the burger has a very mild, subtle flavour to it with that nice hint of Mexican bean but I’d almost like to see something extra. 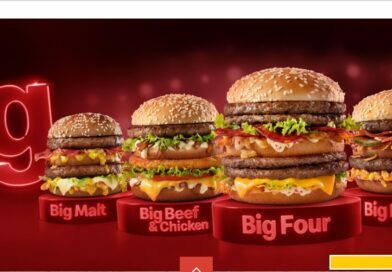 It would be nice if McDonald’s really went for it and added something to make it more spicy – maybe some jalapenos? 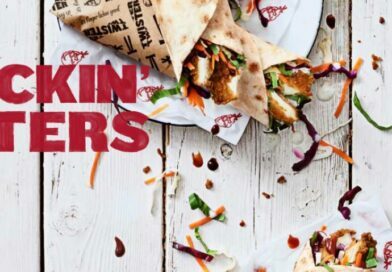 But I assume this doesn’t appeal to their target market and are more than happy for Burger King to have that market share. 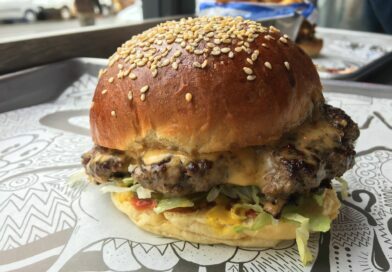 Again this is not normally something I would order but if the mood takes your fancy and you want something different to the standard fare at McDonald’s then this burger may be worth a try. But hurry… this Mexican is only around for a limited time.